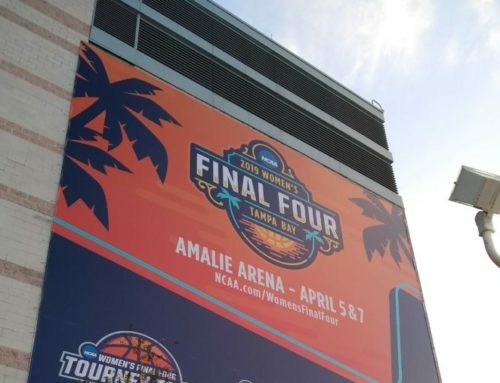 Through eight games, the Notre Dame hoops team has bounced frustratingly between spells of offensive incompetence and spurts of exciting, high-level basketball. Such is the struggle with a team dependent on young talent, a challenge that Mike Brey has not recently faced in his tenure at ND. 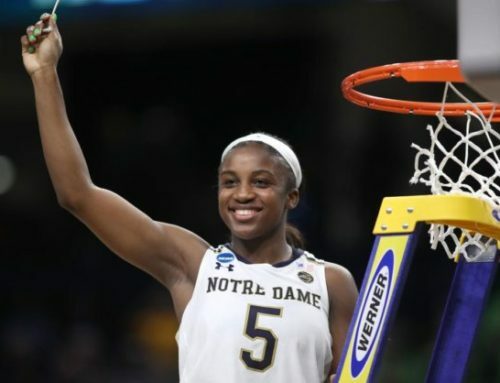 To make sense of these disparate performances that the Irish have posted, I figured that now would be a good time to check in on the five promising newcomers to the program. An eight game sample size is certainly too early to make sweeping judgments on how their careers will unfold, but with a couple games against higher-level competition under their belts, let’s take a temperature check on how the newbies are acquitting themselves. Let’s start out with the wing out of Pittsburgh, Robby Carmody. 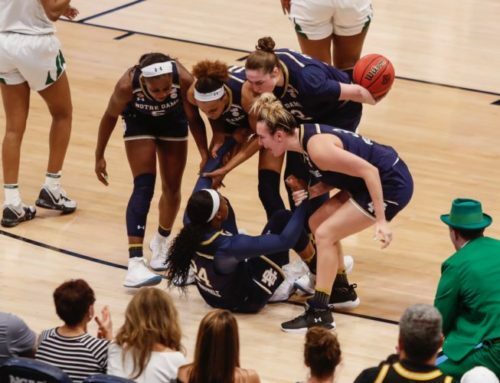 Clearly, Carmody impressed in practices and exhibitions leading up to the season, as Mike Brey made him the first Irish freshman to start a season opener since Torin Francis in 2002. Carmody immediately rewarded that confidence, energizing the team with two steals, multiple drawn charges, and 11 points against UIC. After that explosive debut, Carmody has come back to earth. His most immediately identifiable skill at the college level was his ability to get to the rim. Carmody has continued to attack that area, but after getting to the line for 12 free throws in his first two games, he has only made it back to the stripe once in the past 6 games. Some combination of a nagging shoulder injury, problems with turnovers, and solid play by fellow freshman Dane Goodwin has apparently relegated Carmody’s role to a fringier presence. He has only played 3 minutes in each of the past two games, with his performance against Oklahoma being particularly out-of-control. One way that Carmody’s extreme aggressiveness has been reflected on the stat sheet is his team-leading 27.4% usage rate. When you have the worst offensive rating on the team and you are leading in usage, that’s not necessarily a great combination. Obviously, Carmody is a player who runs pretty hot, and telling him to pull back a bit may just be contradicting what’s in his DNA as a player. Right now, he might be pressing a bit for someone whose shot hasn’t been falling (as has been the case for almost every Irish perimeter player). 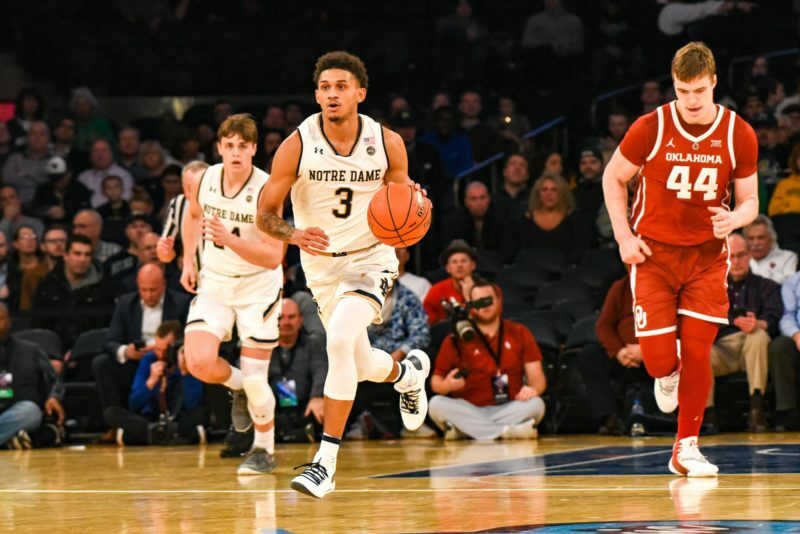 Bottom Line: Carmody is certainly a player whose energy will be useful for an Irish team that lost some of its more fiery leaders in Bonzie Colson and Matt Farrell. However, until his efficiency can come closer to matching his effort, he may find himself as the 9th man in Mike Brey’s rotation. That’s usually a death knell to any Irish player, but in this transition season, we can hope that Carmody will continue being given chances to play himself into a substantial role. Well this guy turned out to be fun! The UConn transfer represented an enormous question mark coming into this year, as he hardly played in the past 3 years due to injury and sitting out as a transfer last year. Many of us have expected Durham to be up-and-down as a result, but Durham has pretty much consistently impressed. After a head-scratching DNP in the Radford loss, Durham has worked his way into being perhaps the most entertaining player the Irish have. His 10-point, 5-block performance completely changed the momentum in the Illinois game, and Durham’s dominance probably swung that result in the Irish’s favor. Immediately following that career performance, Durham topped himself against Oklahoma, going 7-8 from the field for a career-high 15 points. While Durham’s defensive impact has been obvious to anyone watching, his offensive prowess has been nearly as impressive. He has provided a rim-running presence that the Irish haven’t really had post-Zach Auguste, and he has mixed powerful dunks with tougher finishes that required some finesse. He has also looked very confident putting up mid-range jumpers, hitting 4-5 from midrange against the Sooners. I have worried at times that this no-hesitation jumper would make him a bit of a black hole offensively, but he even flashed a couple nice passes to open shooters in the Oklahoma game. The Irish actually looked like they were running the offense through Durham for parts of his 15 minutes on Tuesday. His FT shooting hasn’t been great, but his form looks smooth and I don’t think he’ll be too much of a liability there. This number indicates that ¼ of opposing teams’ 2-point attempts that have been put up with Durham on the floor have been swatted by Durham. That is absurd. To give some context into exactly how absurd it is, Durham leads all of Division 1 in this statistic among players that have played as many minutes as he has. The next-highest BLK% I could find from a recent ND player was Bonzie Colson from last year, who put up an impressive 7.3% last season. Durham is quadrupling that. 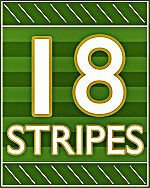 On the surface, this number seems like it has to come down, just because no one does this over a full season. But in the meantime, how fun is this? Durham is the rare defensive player that my eyes are constantly drawn to regardless of where the opposition has the ball, somewhat like a Khalil Mack in the NFL. Even when he isn’t forcefully demolishing the shot attempt, Durham is clearly affecting the way opposing teams are attacking the Irish, causing fadeaways and midrange shots rather than easy attacks at the rim. Bottom line: The sky is the limit for Juwan Durham. Who would have ever guessed that this team’s big man rotation would be our greatest strength so far? John Mooney has been fantastic all year, but Durham’s play demands more minutes. Any time he’s on the floor, he’s capable of changing the flow of the game. As long as his conditioning is up to par, I can only see him becoming more and more of a weapon. The “ice” to Carmody’s “fire” (as our own 4pt shooter put it, “A Song of Ice and Fire, ND’s Class of 2022 wings”) Dane Goodwin has been another bright spot as he comes into his own. After playing only 3 minutes against Radford, Goodwin has emerged as a dependable presence in the Irish rotation, playing over 50% of available minutes in each of the last 3 games. After the season’s first game, Mike Brey threw out a Steve Vasturia comp for Goodwin, and he has lived up to that billing quite well. More so than any other freshman (and maybe any other Irish player full stop), he provides a steady presence on the floor that seems to always make the right play. Offensively, Goodwin has done a great job maintaining a flow that has been absent for stretches. Many Irish backcourt members are ball stoppers whose first instinct is to put the ball on the floor and call for a high screen. Goodwin has done a nice job of shooting or attacking if he’s open, but moving the ball quickly if he isn’t. He hasn’t found his shooting stroke yet, but he continues to make defenses respect him on the perimeter and make strong cuts to the hole. His defense has been very solid, as he moves his feet well, gets right into his guy, and contests shots. Goodwin leads the Irish in each of these stats, and each of them paint the picture of him as a perfect 5th man in any lineup. Avoiding turnovers has been a hallmark of Mike Brey teams forever, and Goodwin’s carefulness with the ball has definitely been rewarded with more minutes. With Gibbs, Hubb, and Pflueger shouldering the creative load in the Irish offense, Goodwin can be a secondary creator that makes good decisions. Secondly, Goodwin’s ability to avoid committing fouls is yet another Mike Brey staple that will keep him on the floor. After Rex Pflueger graduates, Goodwin looks like an immediate option to start picking up opponents’ scorers. Bottom Line: The only hole to pick in Goodwin’s game so far has been that the shots haven’t fallen. That’s an issue that has plagued the entire roster, and Goodwin’s decorated high school career indicates that this is likely little more than a slump. Every other facet of his game has been very encouraging, and he looks like a 4-year guy that Brey will find hard to ever keep off the floor. While Carmody came out of the gates winning the 5th starting spot, Prentiss Hubb managed to secure it a few games in and looks unlikely to concede it. In an interesting turn of events, the Irish have opted to use Hubb as the primary point guard in lineups that feature both him and Gibbs. While Gibbs remains the Irish’s go-to guy when they need a bucket, I think this nonetheless shows that Brey has a ton of confidence in Hubb’s ball-handling ability, as well as his capability to immediately run the offense. With Hubb’s driving ability and duties as a primary ball-handler, he’ll probably be taking a lot of trips to the free throw line this year, and a 50% clip won’t cut it. Hubb’s shot mechanics are a bit wonky, as he kind of just flicks the ball up there in a high-arcing rainbow. This hasn’t prevented him from being shy putting up shots from deep, but after a decent start, his shooting numbers have gotten a little iffy. The Irish have had big-time woes at the charity stripe in consecutive games, and if Hubb can’t be a reliable presence there, I think we could see Goodwin replacing him in late-game scenarios. Bottom line: Hubb has all the tools to be the next in a long line of dangerous Irish point guards. His recent struggles have shown that he might not be able to be an immediate game-changer, but as long as he steadily improves on both sides of the ball this year, we have every reason to be excited about this kid. Finally, we get to the stretch-4 who was touted as perhaps the most likely guy to immediately contribute to this roster. With Laz, the story was simple: this guy can shoot the lights out. While he hasn’t done that so far, there have been other reasons for optimism. First of all, I have been impressed with his willingness to crash the boards and do some work down low. Obviously, Laszewski is very skinny for a 6’10” guy, and Mike Brey even said that he considers Laz an option to play at the 3 despite his height. Although things may change against ACC opposition, Laszewski has acquitted himself quite well in the interior, grabbing an offensive rebound in 7 of the 8 games the Irish have played so far. Defensively, he will continue to be a work in progress, but he competes and hasn’t been a liability early on. As for the 3-point shooting, it doesn’t seem that Laz has gotten as many comfortable looks as he’d like so far. Some of his pick-and-pop attempts have seemed a bit rushed, and he just hasn’t had a ton of wide open, in rhythm, catch-and-shoot 3’s. That is where he can be lethal, and the Irish just haven’t been able to find too many of those opportunities yet. That being said, many of his misses have been front-rimmed or back-rimmed and just rattled out, so I assume there is some positive regression coming (sooner rather than later would be nice). As I touched on earlier, Laszewski has been able to compensate for his lack of knockdown shooting with some nice work in the interior. He has already shown the ability to parlay his size into some easy buckets, and he may grow into a more well-rounded offensive weapon than we anticipated. I’d be surprised if he turns into a Matt Ryan-type player who hoists 80% of his field goal attempts from deep. Bottom Line: It’s wait-and-see with Laszewski so far. The one thing this Notre Dame team has needed more sorely than anything else is some hot shooting from deep, and Laz seems like as good a bet as anyone to finally start knocking some down. That alone should keep him as a featured option in various Brey lineups, and anything else he provides will feel like gravy. ICE & FIRE! I do wonder openly now whether we’ll know sooner rather than later that the goal of this season is to build for next year and beyond rather than trying to be the 9th ACC team to win a bid. While I have learned not to question Brey’s rotations, I am mystified why Durham isn’t getting more minutes. The DNP against Radford is especially puzzling, is there some type of attitude/discipline issue? I just think Brey wasn’t sure if he would commit a lot of turnovers and be a bit of a black hole on offense. He has been better than any of us thought, but I still think there will be some tough games on offense. He’s a beast on D though! I think a big part of Brey’s hesitance to play Durham had to do with giving Burns a decent chunk of playing time for a senior captain. Brey never likes to go too deep with his rotations, so squeezing in that many bigs looked like it could be an issue. Clearly, Durham is more talented than Burns and that might have played into the transfer. Now that he’s clearly established as the backup 5, I hope we can see him play 20 minutes when he’s dominating like he has the past couple of games. Well I guess we’re in for a brutal season. Like I was trying to write a few weeks back, it is impossible to draw a straight trend line off of a single performance. Saturday night was an excellent example of that. They played horrible, then played great, then couldn’t hold on. The data and evidence so far points to this being a very rough season. However, there’s hope TJ pulls out of the nosedive, or one or two of the frosh make the big leap, or Durham continues to mature/improve at this rate. Each of these things will likely be true and false at different points of the year. Young teams need to learn how to win. The last few weeks have had some painful lessons, but there’s hope they will learn to apply them by the end of the season.